Summer’s here for all intents and purposes and with that comes selfies, sunsets, cocktails and canoes. For Lisa LaVecchia, vice president and CMO of the Ontario Tourism Marketing Partnership Corporation (OTMPC), those photo opportunities represent a powerful marketing and branding tool via social media for Canada’s fourth largest province. LaVecchia’s team has a specific process: when they create a page on a social channe l, they wholely commit and the results are staggering. On Facebook, Ontario Tourism has 252,000 Likes. On Twitter @OntarioTravel has 54,000 followers. But it is Instagram that the organization has seen the fastest growth. Since May 20, the brand has seen a 10 per cent increase in followers from 64,000 to more than 70,000 today. LaVecchia attributes this success to a toolkit she created and shared with her team internally and tourism operators and representatives around the province. “We have more than 100,000 consumers using #DiscoverON, that number grows every day so we know the message is getting out there,” said LaVecchia. It isn’t enough to run an account by committee, someone has to own it. In LaVecchia’s case, she brought on Jennifer Curtis as director of digital marketing to lead social for the brand. So, find your own Jennifer, she’s taken! “We’re a community not a campaign,” said LaVecchia, which means staying on trend and finding new ways to engage. This summer the brand will invite people to share photos for a series OTMPC is calling “From Where I Stand”. “It is already something that people love to do but we’ll share your photo of where you are standing in Ontario,” said LaVecchia. The key here is to sometimes keep it simple—and it capture the zeitgeist when you can. What works well one side of the province, might not, on another. To help mitigate this and maintain an honest brand voice throughout Ontario, LaVecchia has armed tourism information stations with their own branded social accounts to serve as ambassadors. Traditional tourism information centres hand out pamphlets, as does OTMPC in between engaging with potential visitors to a region on social media. By extending the team beyond a traditional base of marketers you can also increase the number of eyeballs scanning for unique content to crowd source. Tag your photos #DiscoverON to give us permission to repost. A brand cannot be in every corner of a region but tourists can be. Tap into your audience to create content. 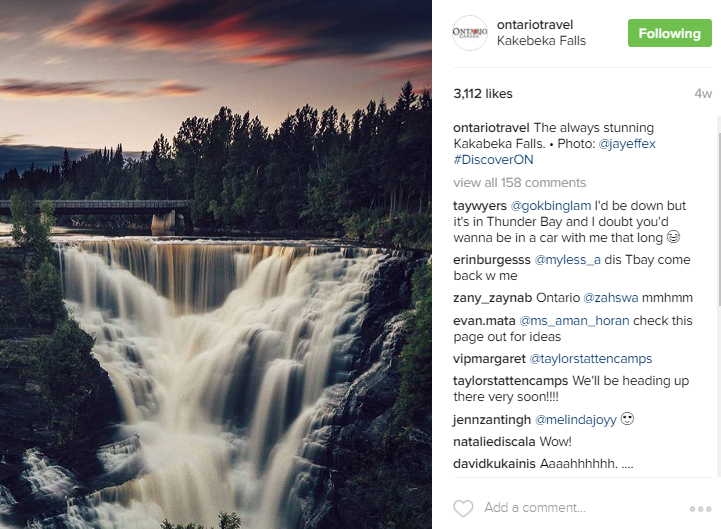 Ontario Travel will also augment social reach by using sponsored posts on Twitter and Facebook. Don’t be afraid to spend money to get results. It is a pay-to-play environment. Every platform has its own character and content requirements. Just because a piece of content gets traction on Facebook doesn’t mean it is suitable for Instagram. Facebook is where a community comes to talk and Instagram is where it comes to gawk. Regardless of the platform, the tourism industry’s social media goals should revolve around creating content that feels organic and represents the region appropriately. Find new visitors and listen to what interests them using Cision’s social intelligence solutions. Learn how to monitor everything in this whitepaper.